You'll forget that this creamy, comfort food dish is oil and dairy free. After a week of meal-prepped salads, hitting my water quota and artfully navigating bagel Wednesday (aka avoid the office kitchen at all costs), I am ready for a hearty comfort food meal come Friday night — I also have zero energy left to slave over the stove after a long week. 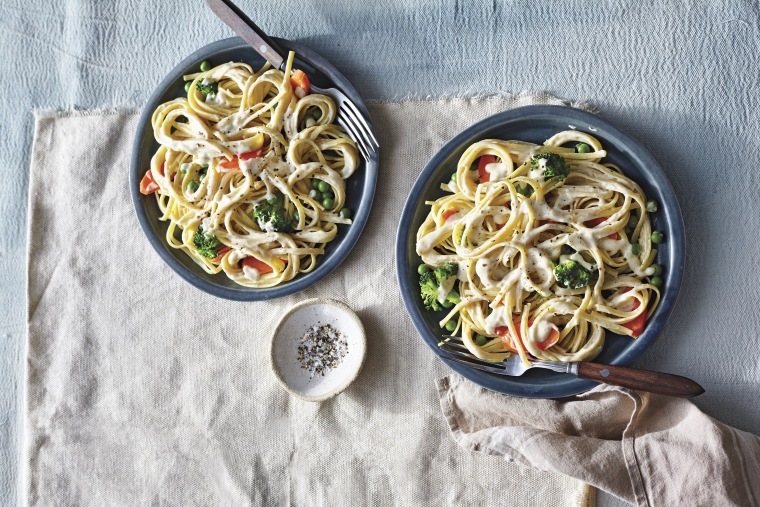 Enter: a 20-minute Alfredo recipe that solves both of my problems (without completely derailing all the hard work I put in during the workweek). Brandi Doming says that this is the most popular pasta recipe from her blog, and it's not hard to see why. Most of the ingredients are things we all have stocked in our pantry, and it manages to achieve a perfectly creamy texture without any dairy whatsoever (making it a smart recipe to have on deck for when your vegan friend comes for dinner). Plus, it's easily customizable: throw in any extra veggies left over from the week. I'm thinking spiralized zucchini, carrot coins and diced red peppers. While waiting on the water to boil, make the sauce. Add the broth, cashew butter, vinegar, yeast, flour, garlic powder, Italian seasoning, salt, and pepper to a high-powered blender or food processor (see Note); blend until very smooth, scraping the sides as needed. It will be very runny. Add the sauce to a large pan over high heat. Once it starts simmering all over, immediately turn down the heat to medium-low, and whisk continuously for about 3 minutes until thickened. Don’t walk away from it, as the sauce will get lumpy if you overcook it. You want it to be smooth but not overly thick. It will thicken even more as it cools. Remove from the heat, and cover. Drain the pasta, and divide among the plates. Add the sauce. Taste and add more salt or pepper, if desired. Add in any veggies, if desired. *Editor's note: If this is your cheat meal for the week, enjoy as is! If you'd like to make it even healthier, cut back on sodium and calories by adding even more non-starchy veggies to bulk up your meal. You can also swap in whole grain pasta or your favorite bean-based pasta for an extra boost of protein. NOTE: To make this gluten free, use your preferred gluten-free pasta. Note that gluten-free pasta cooks faster and gets mushy easily, and I’d suggest rinsing it once cooked since it can get rather sticky. If you are using whole cashews (instead of cashew butter) and do not have a high-powered blender like a Vitamix, you’ll need to soak your cashews for 8 hours or preferably overnight in a bowl of warm water to soften, and then drain, rinse, and proceed with the recipe. Otherwise, the sauce will be gritty. If using soaked cashews, a food processor works better than a regular, non-high-powered blender. For the nutritional yeast, it’s important to use a non-fortified brand, as some can leave a strong vitamin taste. I like Sari or Dr. Fuhrman’s. If you avoid yeast, simply omit it and increase the salt a bit, to taste. If you cannot find the Italian seasoning, you can sub with 1⁄4 teaspoon each of dried oregano, thyme, basil, and rosemary.